If people eat the correct proportion of high-quality protein, their carbohydrate, fat and overall energy intake will take care of itself. This is the hypothesis of 2 Sydney professors who believe it has the potential to change the way doctors treat obesity. Too low a proportion of protein in the diet makes people gain weight because they over-compensate with fats and carbohydrates to get enough protein. Too high a proportion of protein will help them lose weight, but is also likely to speed up ageing and increase the risk of late-life disease, especially when coupled with low proportions of healthy carbohydrates. That’s the essence of what professors Stephen Simpson and David Raubenheimer have named the protein leverage hypothesis. 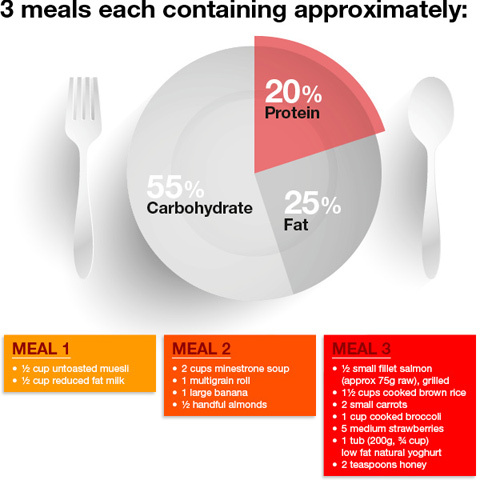 Good nutrition, they say, is all about the balance between macronutrients (fat, protein and carbohydrates) in the diet. And key to that balance is the ratio of protein to carbohydrates and fats. “That is the big theme,” says Prof Simpson, the academic director of the Charles Perkins Centre, Sydney University’s $500 million investment in finding a way to ease the burden of obesity, diabetes and cardiovascular disease. The midpoint of the current Australian dietary guideline of 15-25% of energy from protein is about right on a population level. But the challenge is to tailor the proportions according to life-stage, genetic makeup, ethnicity and personal health. The professors are reluctant to put exact figures to their hypothesis at this stage. But the evidence is suggesting that for pregnant mothers it is best for about 20% of energy to come from high-quality protein coupled with healthy carbohydrates and modest amounts of healthy fats. In late middle age it’s looking as if a lower proportion of protein coupled with healthy carbohydrates is a healthier diet in terms of metabolic outcomes than one that is high in protein and low in carbohydrate. “We also know that if you are obese and wish to lose weight, then in the short term a high-protein diet, say 25%, is a good way to go,” says Prof Simpson.